In addition to their versatility and distinctive beauty, concrete countertops have another virtue that appeals to many people, especially the ecologically aware: They are more environmentally friendly, or "greener," than most other types of countertops. "Solid surface materials are made of plastic, engineered quartz materials contain a synthetic resin binder, and granite and marble are nonrenewable mined resources. Concrete contains mostly just good old sand, rock and cement," says Jeff Girard, president of The Concrete Countertop Institute and one of the Concrete Network's technical experts. But concrete isn't completely eco-friendly, Girard admits. Portland cement production uses up a lot of energy, and mining of aggregate and sand can be environmentally disruptive. Some of the sealers applied to concrete countertops to protect them may also contain toxic volatile organic compounds, or VOCs, he adds. The good news is that you can take a number of simple steps to reduce the ecological footprint of your countertops, such as replacing some of the virgin materials in concrete with recycled waste materials and using a nontoxic water-based finish. Here are some strategies for making your concrete countertops as green as possible. 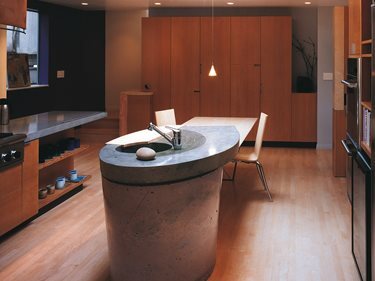 In his video on Sustainable Kitchen Countertops (above), Fu-Tung Cheng says the sustainability of concrete countertops depends on good, timeless design. "In countertop making, design is one of your most important tools," he explains. "Good design is sustainable. It means people will appreciate something over a long period of time." When you combine timeless design with the inherent durability of concrete, your countertops will serve you well for decades--both functionally and aesthetically-and thus are unlikely to need replacement. This not only conserves materials and eliminates waste, it saves you the expense and hassle of ripping out worn, outdated countertops. In his Berkeley, Calif., home, Cheng still has the same concrete countertops that he built over 25 years ago. "Everything is still working and functioning well. It is timeworn, but in a way that is elegant," he says. Just how green and environmentally responsible your concrete countertops are depends largely on what goes into the mix. Portland cement, which constitutes about 12% of most concrete, is highly energy-intensive to produce. You can reduce this environmental liability by using a countertop mix that replaces some of the cement with materials such as fly ash, slag cement and silica fume-all industrial waste byproducts from coal-fired power plants, steel mills and other manufacturing facilities. Several companies have come up with proprietary "green" mix designs well-suited for concrete countertops. One such product is Buddy's Ultra Green, which was developed to make a superior general purpose concrete that re-uses material formerly headed for the landfill and halves the amount of resource intensive cement. Talk to your countertop fabricator as most of them work with a green mix. When shopping around for concrete countertops, ask local fabricators what goes into their mix designs, and consider doing business with a contractor that uses recycled waste materials. Note that replacing some of the cement in concrete with these byproducts should not affect the quality, performance or even the cost of your countertop. Fly ash, for example, is cost competitive with portland cement and has unique properties that can enhance concrete durability, strength and impermeability (see Fly Ash: Making Concrete Stronger, More Durable, and Easier to Work With). Instead of using conventional precast concrete, many concrete countertop fabricators are switching to GFRC (glass-fiber reinforced concrete), not only for its performance and aesthetic benefits but also because of its sustainable attributes (see Benefits of GFRC). The material uses significantly less portland cement than regular concrete, and it often incorporates large quantities of recycled materials. 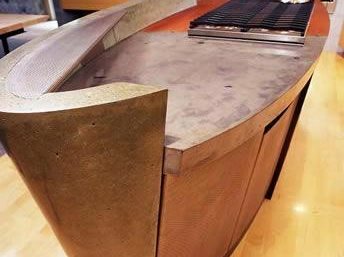 Steve Silberman, president, and partner Tommy Cook of Absolute ConcreteWorks in Seattle (see Concrete Countertops Seattle), use a proprietary GFRC mix, called SoundCrete, to make countertops, fireplace surrounds, sinks and other concrete elements. "GFRC is more eco-friendly than standard wet cast precast," he says. "Because of its high strength, we are able to pour our structure at 3/4 to 1 inch thick rather than the typical industry standard of 1 1/2 or 2 inches thick." Silberman notes that his company's GFRC mix uses up to 50% less portland cement than regular concrete, helping to save the energy typically consumed to manufacture cement. "Rather than using fly ash to further reduce the portland cement content of our mix, we use a post-industrial recycled glass product from Vitro Minerals," he says (learn more about using recycled materials in countertops). "Our mix design also eliminates the need for gravel for structural integrity, although we do continue to use small amounts of gravel and post-consumer or post-industrial glass, metal or other recycled materials strictly for decorative purposes." Most of us are familiar with the environmental benefits of buying fresh produce from local farmers, which eliminates the consumption of fuel required to truck in produce from non-regional growers. The same holds true for the materials used in your countertops. Ask your countertop contractor if they make products using materials harvested or produced near your home, such as aggregate from a local river or quarry and cement produced in a regional plant. If you use a local countertop manufacturer, in almost all cases your countertop will be made locally too, either in the contractor's shop or even in your own home, if the countertop is cast-in-place. 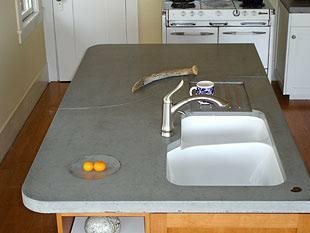 "Instead of getting a countertop material like granite and having it quarried in Italy, hauled to China for finishing, shipped by boat to the Untied States, and then trucked to local people to process and install, concrete is much more direct with a far smaller carbon footprint," says Fu-Tung Cheng of Cheng Design and author of the book Concrete Countertops. "Making your concrete countertops locally and not driving them across the country is a very green and sustainable enterprise." Straw Bale Home Features Concrete Walls and Countertops Tellus 360 Design & Build, Lancaster, Pa.